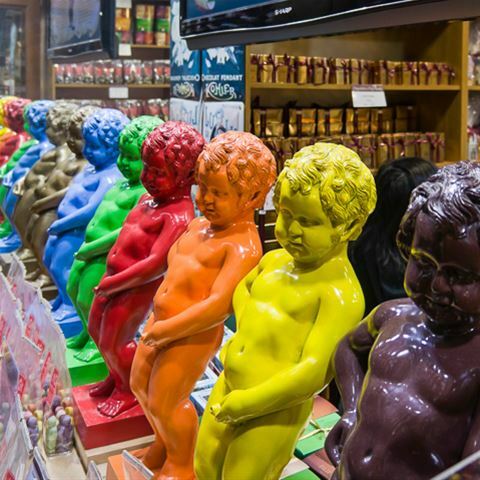 Pass2Europe | Belgium | Manneken Pis – The statue with the richest clothing collection.. The Manneken Pis is located in the heart of the city, at the junction of Rue de l'Étuve/Stoofstraat and Rue du Chêne/Eikstraat. It was designed by Jerome Duquesnoy, put in place in 1618 or 1619 and soon became part and parcel of Belgian history and patrimony. Many great legends bring this little statue to life in the hearts of visitors, and the question is why was this statue erected? One story tells of a tourist father who lost his son in the city and after receiving help from villagers to find the boy, he gifted this statue to them. There is a story that depicts the boy as the victim of a witch’s spell, frozen in time as punishment for peeing on her door. Another, more daring, tale is one where the boy was a spy during a siege of the city. He literally put out a ploy to bomb the city by urinating on the explosives! Many stories such as this have given the Mannekin Pis a firm place in Brussels’ city-life but none would compete with its present-day glory. As the first citizen of Brussels, the little pee man received his first costume in 1698 by Maximilian II Emmanuel, Governor of the Spanish Netherlands. In 1747 he received a garb of brocade from King Louis XV. 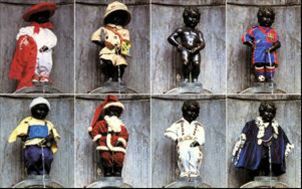 Receiving about 17 new costumes every year, the Manneken Pis has today a wardrobe of more than 900 costumes! This practically makes the statue richer in clothes than every Hollywood star. Since the 18th century, the little statue is dressed up to mark special occasions and festivals. The Manneken Pis wears his tiny costumes on fixed dates 23 times a year. 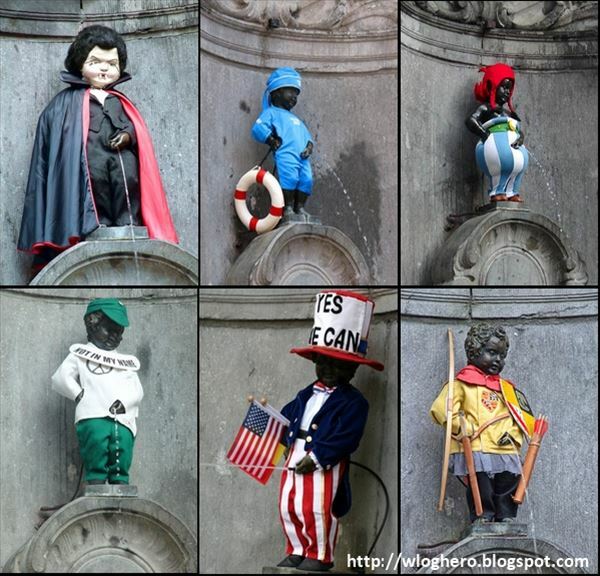 Additionally, the Friends of Manneken Pis change his costume two or three times a week. 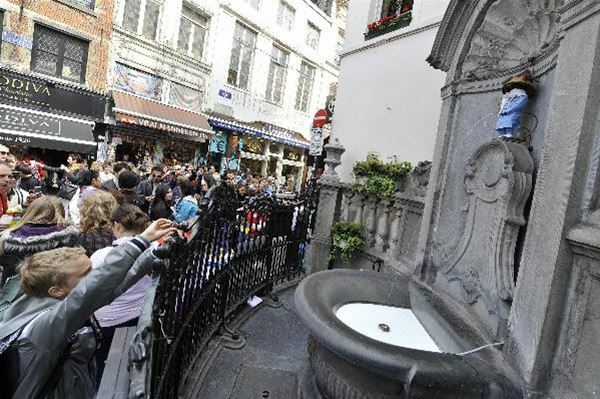 On special occasions, brass-bands would play and Manneken Pis would be hooked up to different flavours of Belgian Beer, which is poured from his fountain tip and given out to the public. In 2014, Manneken Pis was dressed up in traditional African rancher garb and made to “pee milk” instead of water in honour of World Milk Day. The presentation of each new costume is an occasion for a big event for the city of Brussels. 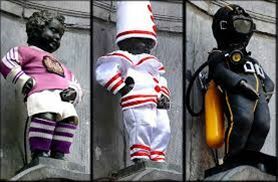 Throughout history the Manneken Pis wore national costumes, military uniforms and athletic outfits. He became Elvis Presley, Santa Claus, Asterix, Rap singer, Dracula, Nelson Mandela. He supported several causes such as: Amnesty International, Handicap International, Peace and friendship. He guarded the city as a boy scout, a policeman and a firefighter. He earned money for Brussels as a carpenter, a farmer, a cook, a hotel concierge, a nurse, a postman, a controller. The costumes are given as a gift. For any donation, an official request must be sent to the College of the Burgomaster and Deputy Burgomasters of the City of Brussels. After the request is examined by a committee and gets approval, an official presentation ceremony is organised. The new costume is then added to the little fellow’s wardrobe in the City of Brussels Museum in the King’s House. With a great sense of humor, the Belgians smartly managed to immortalize every period of European history and every global trend of the last few centuries. 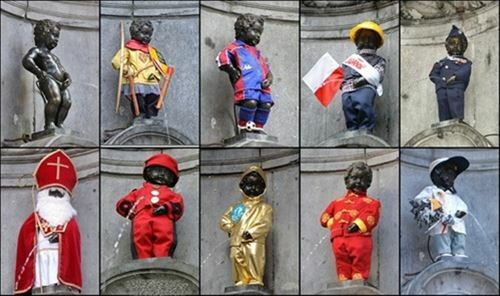 The Manneken Pis is the emblem of the rebellious spirit of the City of Brussels.